A professor, an entrepreneurial mother, and an engineer got together one typical afternoon. The professor served the coffee with a new found product. Instead of white sugar or artificial sweetener, he offered them a natural alternative — a sweetener extracted from the coconut tree. It tasted so good, their conversation reached an all time sweetened high to churn something up! The professor went to Mindanao and, on a handshake, began paving the way for a long-term livelihood program for the Filipino farming community. In Manila, the wheels churned to come up with the proper packaging that will ensure that the sweetener, being 100% all-natural, will reach consumers as fresh as it was the day it was carefully packed. Two years later, Suchero was born. Providing a Healthier Alternative for the World! The Churner Group is one of the first to offer a low glycemic all-natural sweetener from coconut sap – Suchero. With its office based in the Philippines and pursuing business in several countries all around the globe, The Churner Group is providing an affordable, healthy sugar alternative that is good for the whole family, and can help in the proper management of diabetes, weight control, and the prevention of heart disease and obesity. We trace the beginnings of The Churner Group to the year 2005 when three of the major stockholders’ paths crossed while they were involved in the production of their own brands of Virgin Coconut Oil – a healthy all natural oil derived from the coconut tree. They decided to put their resources, expertise and strengths together, and with their passion to provide healthier alternatives for the Filipinos, and the world, led to the birth of an all natural low GI sweetener. The Churner Group, incorporated in May 2008 is involved in the production, packaging, distribution, marketing and sales of the low glycemic all natural sugar substitute – Suchero. Its principal office at Richville Corporate Tower located in the heart of Madrigal Business Park, Muntinlupa City provides its staff and management a clean green healthy environment. Muntinlupa City located on the south end of Metro Manila, became the first major urban centre in the Philippines to ban the use of plastic bags and polystyrene containers. Today, The Churner Group represents tremendous growth and opportunity to meet current trends of choosing a healthy lifestyle and quality diet. The company is developing and marketing new and exciting products every year. We are working in partnership with several food producers, as packaged food manufacturers move towards the use of Suchero for their new products. The Churner Group puts a lot of weight on Research, Development and Quality Control. From the selection of coconut trees right through to the final packaging of Suchero, we spend our time and resources to achieve quality at every stage. 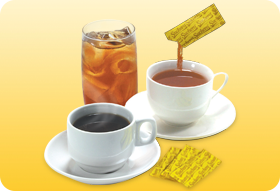 Our aim is to provide the market a 100 percent all natural sweetener that will meet the highest international standards. So we take pride in our purposely built modern facilities and techniques to extract the best and purest coconut sap to produce Suchero. The Churner Group guarantees that Suchero will reach its consumers as pure and as fresh as the day it was packed. You can count on Suchero for its quality and purity. "I love to try new products in the market, especially natural and organic products. I believe that a healthy body starts with eating healthy foods,. Since I was introduced to Suchero 2 years ago, I have been using it to sweeten all kinds of foods and drinks – from breakfast cereals, oatmeal, snacks, desserts, to my coffee and other beverages. With a low glycemic index, I believe it’s the healthiest sugar there is." 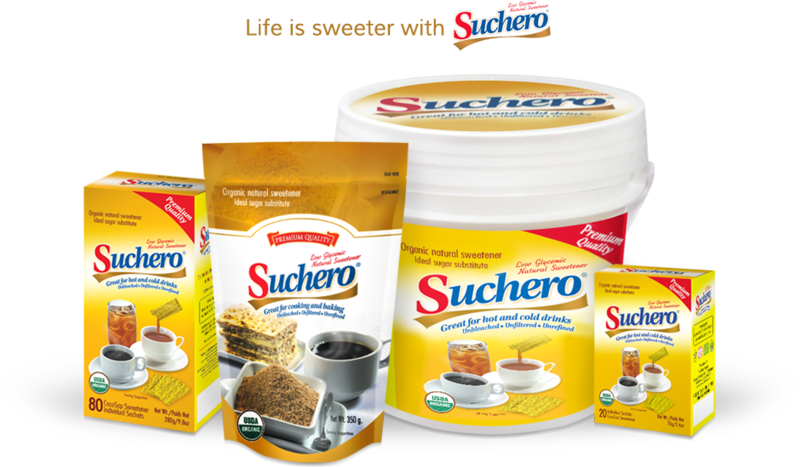 "Suchero is one of the basic ingredients why we are able to claim that our “sweetypies” baked goodies are made healthier."